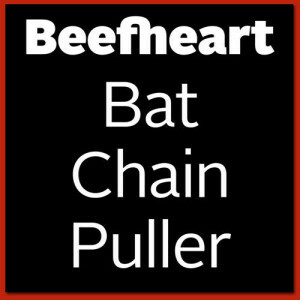 I’ve finally put a review of Bat Chain Puller up on the site. If you haven’t bought a copy yet and are unsure about whether to or not … read it! If you’ve already read it (it’s been up for a few days) then take another look as I’ve just added an intriguing update about the version of Hobo-Ism that’s on the album. Although I ordered the album from Barko Swill when it was originally announced I’m still waiting on my copy! Guess they must have sent it by snail mail (literally!) So I bought another from the very friendly G & S Music who sent it to me as soon as they got theirs (Thanks Dave!). Bat Chain Puller … at last, at last! Album takes a while from Music Today. Mine was dispatched on Feb 25th and arrived on March 13th. The album is almost identical to the running order on the Ozit release “Dust Sucker”. Does anyone know if the Ozit line that there material was from Don’s copy of the original tapes is actually true? If so, did Don give this material over freely or was it aquired by some nefarious route??? Benjamin Horrendous beautifully sums up what we all think of Dust Sucker. @Anonymous – Ozit didn’t have a special source for ‘Dust Sucker’. The album had been circulating on tape and CD long before Ozit were around. As I explain in my review Virgin (believing they were going to release it) had already sent out tapes of the album to reviewers and radio stations in 1976/77. Those tapes are the source of all the bootlegs, and that includes Ozit. I just got my copy last night. Really sweated it out, like everyone else. Had some problems with this one, but eventually it was all straightened out. Never managed to get the parcel tracker on Musictoday working. This would be my third order from them, and like I wrote before, I’m going to wait till future orders are available from more reliable distributors. I really enjoyed this one. It has a very ‘soft’ sound, which puts me in mind of CLEAR SPOT… “distant cousins”?… though I wouldnt trade the rerecordings on Shiny Beast, this album has its own feel and it’s nice to hear those old favorites in a new setting. I think they were right keeping Candle Mambo off the album, it suffers without the horns and on the BCP sessions, the guitar has a claustrophobic, ‘strangled’ feel to them. As mentioned in the review, the weirdest track is HOBO-ISM. Apparently, it really is a mystery recording. But what bothered me was the fade out. It’s like they cut it off mid-performance. Don’s still singing and Denny’s still playing. Maybe there wasnt much more to it but it would have been nice to hear what else was coming. Sort of a tease. All in all, a terrific package. edit: Don’s still singing, “Denny”s still playing. And now the question is what happened to the original “Hoboism”? Is it on one of the boots? I am really enjoying the legit CD of BCP. Just a couple of niggles, apart from those already mentioned. Wasn’t Owed t’Alex titled Carson City in 1976? And 81 Poop Hatch just Poop Hatch? (The 81 presumably added around the release date of Ice Cream for Crow.) So really those titles should have been retained for BCP’s release. Hobo-ism: we need more!! is there any??? Also, I’d like to see more comments on this blog and more interest expressed on the internet. The Magic Band reunion sure is great, but the release of BCP is an historical event! just got mine. just listened. others above have get the differences fairly well covered. what i wanted to add was… the mixed blessing of the original legal problems and non-release. first of all, it’s great to have two versions (which otherwise would not have happened)both are different and wonderful in their ways, but overall… i think the opportunity to re-do the material, mostly helped. also, to favor the earlier effort implies a slight to Lucas, Tepper, Feldman, Fowler, etc. i’m glad we now have both. Can’t stop playing Owed T’Alex over and over again. Can you wear-out a track on a CD? No you cannot wear out your CD by doing that with “Owed t’Alex”, but you might very well wear out a synapse in your brain, as I’m sure the great man himself would have told you if he was still here with us. I miss his larger than life presence on the scene.